A man tasered in Spencer Road earlier this year “said he had a gun and was going to shoot police,” according to a ‘use-of-force’ report filed by one of the arresting officers. Police thought he was exhibiting signs of madness and tasered him. He was one of 13 people police believed were showing signs of mental illness that were stunned last year. “Between April 1, 2014 and March 31, 2015 there were 19 incidents in which a taser was fired or stun driven on 13 individuals (i.e. more than one officer may have tasered the same individual) in which the incident involved what an officer perceived to be a mental health issue. “The PSNI use of force report asks officers to give their ‘perception’ of the behavioural factors involved in any incident where a taser has been deployed in any way and gives officers the following choices: mental health, alcohol, drugs or other. It is common for multiple behavioural issues to be selected as being an influencing factor in any such incident,” the police explained. Twelve of the tasered individuals were men and it seemed to officers that they were about to hurt themselves, members of the public or members of the police. A forty-three year old woman “attempted to cut her throat with a knife” in an unnamed hospital, according to police. A boy, aged 16, was “self-harming with a broken bottle and standing in a threatening position with a hurling stick” when he was tasered in a house. A taser was used on a 30-year-old man in Spencer Road in March. He had been threatening to shoot police. A 20-year-old man who charged at police who believed he had a knife was tasered in a garden driveway. A 43-year-old “moved aggressively towards police with two swords in his hands” and was stunned. A 51-year-old man who threatened to self-harm with a blade was also tasered. Another 43-year-old who threatened to hurt himself and police with an 18 inch knife got the same treatment. A 21-year-old who “had stabbed a number of people in a house, was holding a knife to his own throat and another against a female’s throat and was threatening to kill both” was also tasered. A 38-year-old man who threatened to kill his mother, her partner and himself was stunned, as was a 28-year-old who was self-harming with a knife. 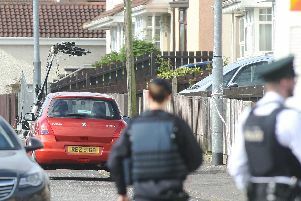 According to the PSNI the information is only based on the ‘perception’ of the police officer.